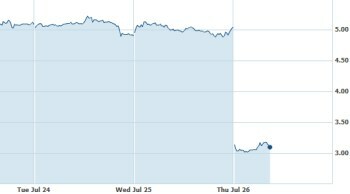 Zynga blames Facebook for a disastrous second quarter that saw its share price plummet by more than 40 percent. Despite CEO Mark Pincus' best efforts to put a positive spin on the situation, the fallout from Zynga's second quarter financial results are nothing less than an absolute train wreck. Earnings of $332.5 million for the quarter were actually up 19 percent year-over-year but fell short of the predicted $344.8 million, and while that represents a shortfall of less than ten percent it resulted in a plunge of more than 40 percent in the company's share price in after-hours trading. Zynga shares dropped from just over $5 - itself a far cry from its $10 IPO and peak of $15.91 - to as low as $2.97, before bouncing up to a little over $3, where it currently sits. "Our games reached record audiences, achieving over 300 million monthly active users. We grew our mobile footprint five-fold in the year to 33 million daily active users making Zynga the largest mobile gaming network," Pincus told investors. "Getting beyond the Facebook web footprint through mobile is going to give us more growth opportunities for games," he added. In fact, Zynga pointed the finger of blame for its woes at its old social gaming partner, saying that changes to the way Facebook promotes games favors new releases over older ones. "Our users did not remain as engaged and did not come back as often," said Zynga COO John Schappert. "Instead new games were promoted." Schappert did express optimism about Zynga's upcoming slate of new games, including Chefville and a new FarmVille, which he said is "reimagined from [the] ground up and looks amazing," but the company has nonetheless reduced its outlook for the fiscal year. "We are lowering our outlook to reflect delays in launching new games, a faster decline in existing web games due in part to a more challenging environment on the Facebook web platform and reduced expectations for Draw Something," Zynga said. The company paid roughly $200 million for Draw Something developer OMGPOP in March, but the game's popularity has tailed off rapidly and dramatically since the acquisition.